Last week I left the heat and humidity of Tennessee for...the heat and humidity of Boston! After a cooler-than-usual summer, the temperature and humidity spiked right before I arrived. But I survived, because being in Boston meant I was back with A.! A. had a summer internship in Boston, and what with me having my own job, I couldn't really go with him. So we spent two months in different apartments with only one weekend to provide a little bit of face-time to balance all those phone conversations. Between the heat of summer and the fact that making an involved dinner for one just isn't that fun, there wasn't a ton of cooking going on in our house. So both of us ended up eating out a fair amount (where "a fair amount" is more than once a week). We agreed, on the way home, that we both needed a period of eating-out detox. 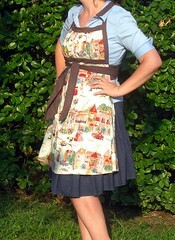 Good thing I went ahead and purchased the pattern for the Emmeline apron from Sew Liberated when there was a 2-for-1 sale earlier this summer. I'm thinking it will be super when I make some "glad you're home" cookies.